The MX-5 is loaded up and we’re heading to Scotland! 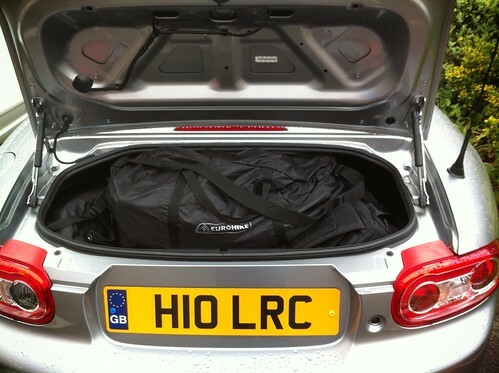 The mk3 MX-5 has a deceptively big boot for a car so small, we’ve managed to fit in both our clothes for a 10 day trip (including a very restrained 5 pairs of shoes for Jen) and my camera kit with room to spare. I’ve been wanting to go to the Isle of Lewis for years, last year I got a car suitable for the roadtrip and for Christmas my parents bought us an island hopper ferry ticket with Caledonian MacBrayne and booked us some hotels, it was going to happen this year! Even before we went to Costa Rica we’d planned our itinerary and booked the remaining hotels and now we’re on our way up! The worst thing about going to Scotland is always the slog up the M6 (although I still prefer it to flying or taking the train), but even before that we had a day at work to get through, which seemed to drag. After the out of offices had been set and the MX-5 brimmed with fuel I pointed it towards the M6 toll road to avoid as much of the V Festival traffic as possible, unfortunately we had to have the roof up due to the rain. The M6 toll was great and we were making good time, until we hit the M6 which was a car park all the way up to Manchester. Jen took over the driving duties doing really well in the traffic and rubbish weather, despite being nervous having only driven the MX-5 a handful of times. I’ll take over the driving again at Carlisle and drive through to my parents flat in Perth where we will be spending our first few nights.